HD-RX-4K-510-C-E receiver. The HD-RX-4K-510-C-E provides auto-switching, amplified audio outputs for speakers, and network connectivity for management and setup. Paired with an award-winning Crestron MPC3 media presentation controller, the HD-RX-4K-510-C-E provides a complete, low-cost, and scalable room system with intuitive control via engraveable buttons and dials that can be configured through the .AV Framework™ configuration portal. The system can be provisioned, monitored, and managed using any web browser via the award-winning Crestron XiO Cloud™ IoT-based provisioning system. Crestron will be demonstrating the entire DM Lite product line in Hall-2, Stand C20 at ISE 2019, 5 – 8 February. The HD-RX-4K-510-C-E accepts multiple transmitter inputs and includes an amp, scaler, and built-in .AV Framework technology. It features 3 DM Lite inputs, 2 inputs for HDMI® connectivity, 1 HDMI output, 2 audio outputs, display control, RS-232, IR, and CEC. DM Lite offers a complete line of simple, low-cost, yet high-performance transmitters and receivers that provide switching and transport of 4K signals over standard CAT5e networking cable. 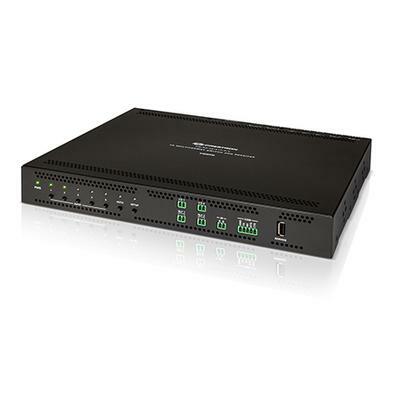 DM Lite products provide local optional auto-switching, network connectivity, audio and video distribution, control distribution, and audio amplification. The entire line can be mixed and matched to create simple systems for most spaces. Crestron is demonstrating the DM Lite product line, along with its other solutions that meet the challenges of the modern workplace, in Hall-2, Stand C20 at ISE 2019, 5 – 8 February.